It's no secret that Halloween is my favorite holiday. Lucky for me, I live on a street that takes the holiday serious as well. People decorate over-the-top like at Christmas time. 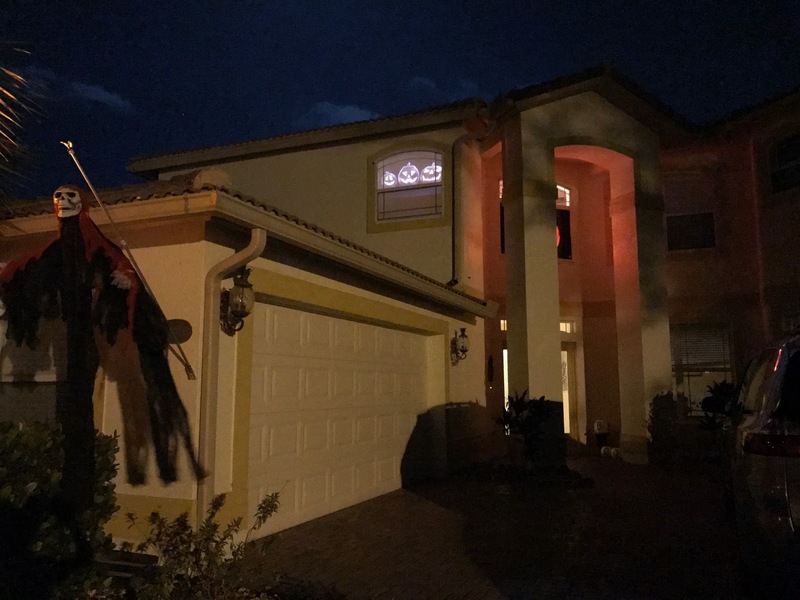 We're definitely among the ones that go all out with lights, blow-ups and homemade decorations. This year though, we are really bringing it thanks to the AtmosFX Digital Decorating Kit, the home decorating effects company that pioneers the art of digital decorating. With this easy to install device, we can project a zombie apocalypse or singing jack-o-lanterns on to our windows. And believe me, these animated digital effects cause everyone to stop and take another look. While I love some of their really creepy options, we are displaying the singing pumpkin scenes since it's not as scary for our preschoolers. Although on Halloween night, once my twins are in bed, I think we'll switch it to the psycho with a hook one or the creepy haunted twins. The kit includes a projector, screen, tripod stand, remote and 14 pre-loaded scenes on an SD Card including Christmas graphics too, so we'll be using it then too. You could also use the same projector to play your own videos and movies. I was really surprised at how easy it was to install, especially considering the high-quality end result that it creates. 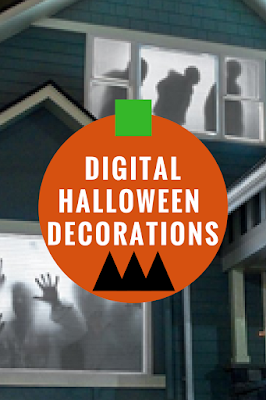 Simply plug in, hang the included screen and follow the prompts on the screen to project your desired decoration. Wifi isn't needed and there are timer settings you can use too. 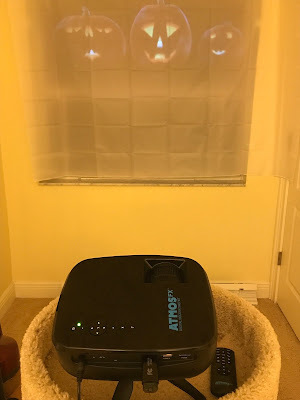 If you already have a projector, AtmosFX also sells the different looped visuals separately, which you could then load onto a USB drive or play through a computer, etc. For $19.99 you can pick a theme and get several interactive scenes or purchase them individually for $5.99 each. They are constantly doing updated scenes each season so I can see myself downloading new packs too. You can also order the different gear like a screen or projector separately too through their site. Disclaimer: I received the AtmosFX unit complimentary for my honest review and opinions -- and as mentioned it rocks!